I absolutely adored the Star Trek edition of the Hidden Universe Travel Guide (see review here), and being a long-time fan of Marvel comics (and renewed fan thanks to the movies) I was really looking forward to this next edition in the series. But what felt like a real travel guide in our make-believe world of the Star Trek universe, feels much more like a comic book atlas than a take-off on the Fodor’s or Frommer’s that sit in the travel sections of book stores. 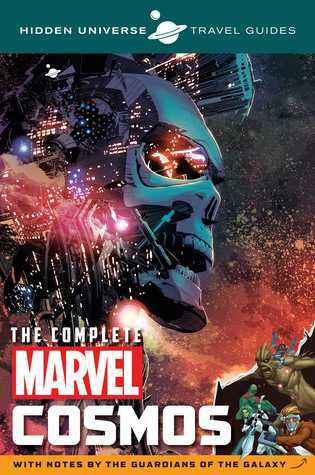 The book is nicely researched and there’s a whole lot of information in here that will really appeal to the Marvel fan. Not being a Marvel historian, I can’t really say how much might be created just for this book and how much has existed through the decades of comic book creation. On every other page (or thereabouts) members of the Guardians of the Galaxy have made additional ‘hand-written’ notes commenting (usually irreverently) on something. These notes are often fun and editor/author Sumerak manages to not get too carried away with it such that it gets annoying or distracting. For the history and humor, this book is a lot of fun. But this is part of a fake Travel Guide series and it kind of doesn’t quite live up to the expectation. Unlike the other Hidden Universe guide I read, this one didn’t make anything sound like a place to visit with sights to see, instead, it seemed more like a history tour guide – places where battles occurred or where famous villains reside(d). While I understand including the Guardians of the Galaxy as note-makers given their recent film and appeal, it does strike me (especially after looking at the opening few pages of the book) that Silver Surfer might have made a better guide through the universe. One of the last things that I didn’t care too much for, but again – completely understand – is the art. As a mock travel guide, I would like to see images that are much more like photographs of the places I’m considering visiting. What we get here is very traditional comic book art which, for this reader at least, serves to remind us that this is not much more than a novelty comic book. If that’s what you are hoping for then, this is a great addition to your collection. If you are wanting something more, or a Hidden Universe series that is strikingly similar from book to book, then this is a disappointment. Looking for a good book? Hidden Universe Travel Guides: The Complete Marvel Cosmos: With Notes by the Guardians of the Galaxy by Marc Sumerak is sort of a comic book atlas that has a lot of interesting and fun information, but departs from the appeal that the Star Trek Hidden Universe book held.